If you don't know what nakshatras are, they are basically a way of classifying and breaking down the 12 Zodiac signs into more specific expressions. This full moon is in the nakshatra of Vishakha. This nakshatra stretches from the end of Libra to the beginning of Scorpio. It signals the beginning of transformation due to a new and balanced state of mind. Ruled by Jupiter, this nakshatra is all about higher understanding and inspired action. Let's see what the cards have to say about this full moon. 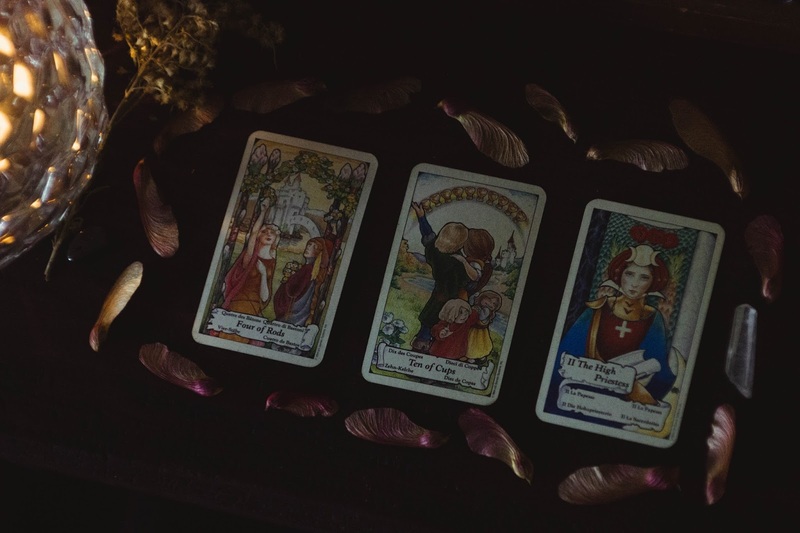 I pulled the cards with the intention of getting a reading for the collective consciousness for the coming week following the full moon. Ah, the four of rods. This is the card I pulled to interpret the general feeling in the air regarding our life paths. This is a really promising card and makes me happy just looking at it. The Four of Rods symbolizes a time for celebration! The woman in the card reaches for the flower canopy above. Flowers unfold in divine perfection, they are gifts of beauty from the earth. Now is a time to resist the temptation to overthink the future. A time to "stop and smell the roses" so to speak. Look at what you have, and celebrate it. Express gratitude for life and all its simple luxuries. Eat a crisp apple on a warm sunny day. Revel in all that nature has to offer, and honor your achievements in life up to this point. 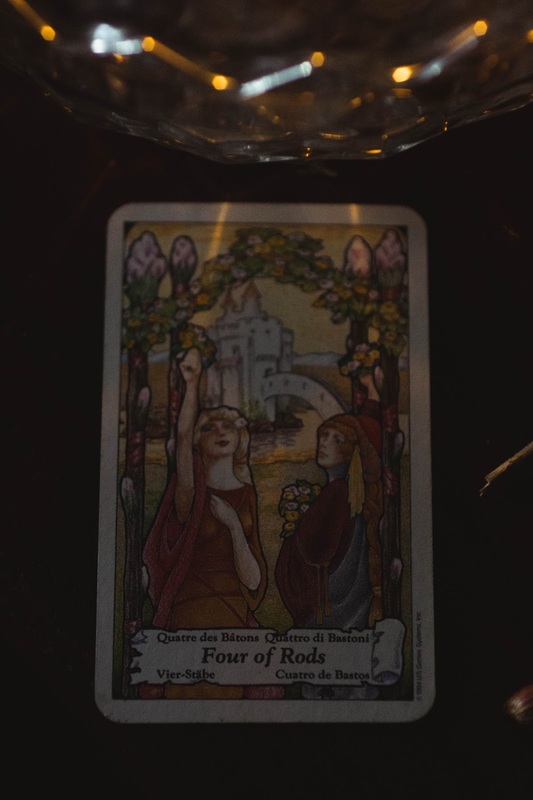 The Four of Rods is a card of abundance. Keep reaching and striving for new heights. The world is your oyster. 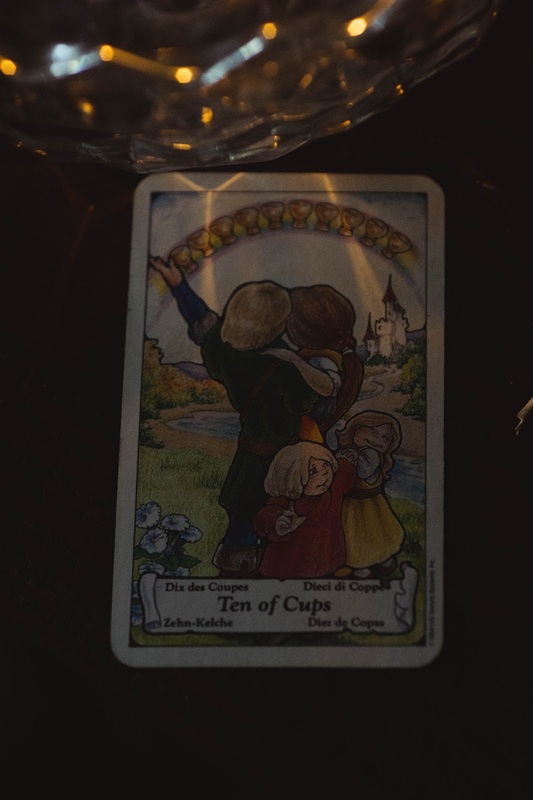 The Ten of Cups is the card I pulled for love life. 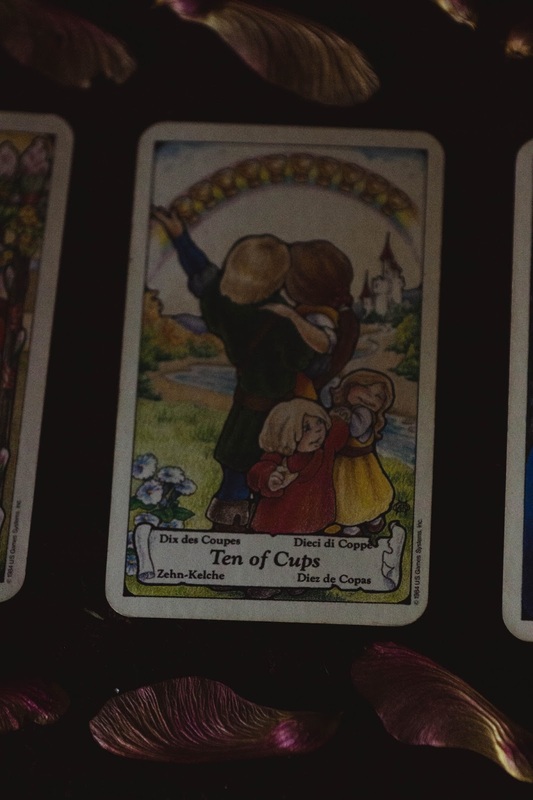 A family stands overlooking the horizon with a rainbow of cups above them. The man almost shouts, "Look at all this glory!" This is a card of happiness-- almost a childlike giddiness and content feeling of peace. If you are in a relationship, this card shows a lavishness of love for each other. You are in a good place, home life is stable, and things seem to be unfolding perfectly. It's a wonderful time. Things have come full circle. Make sure your loved ones knows they are appreciated. Prepare them a nice dinner or watch their favorite movie. Whatever it is, feel good about giving to the ones you love and providing a pleasant atmosphere and experience for them. If you are single, this card signals an inner fulfillment. Perhaps you feel as if you have everything you could ever need right here, in this moment. You feel complete. Whether you are single or in a relationship, this card signals stability, peace, and abundance. Revel in it. 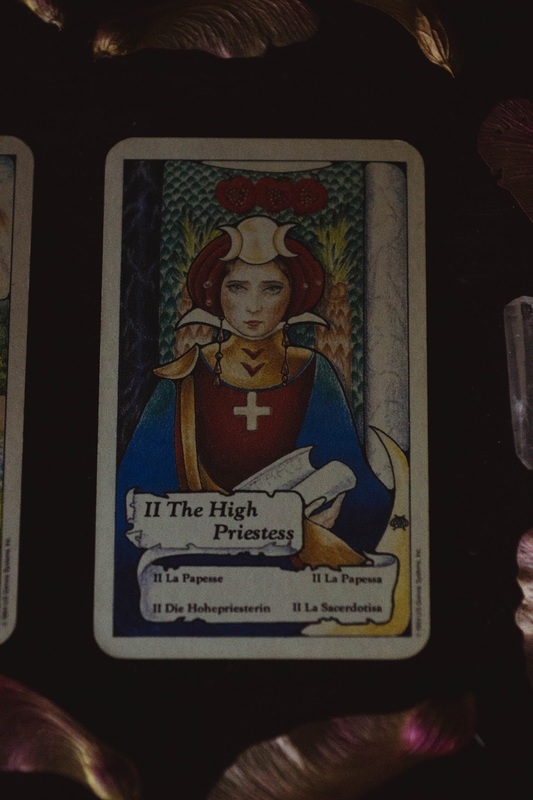 I pulled the High Priestess as the card for career path. The High Priestess represents our subconscious, higher self, and intuition. This card is all about lining up our career with our inner truth. It represents exploring your ultimate, bottom-line values and making sure your "work" is in alignment with those values. It's a time to really listen to your inner voice and ask, "is this the type of work I want to be doing?" and "Where are my daily actions leading me?" Sometimes people don't like to listen to their inner truth. Perhaps it's too discomforting or life altering. But one can only ignore their subconscious for so long until things start to crop up such as illness or disharmonious relationships. Really listen to what you feel regarding your career, not what you think. Now is not a time for action, however, it is a time for centering your compass. Redefining your true north. What direction are you heading in? Overall, the full moon in Vishakha can be a bit of a strange time. 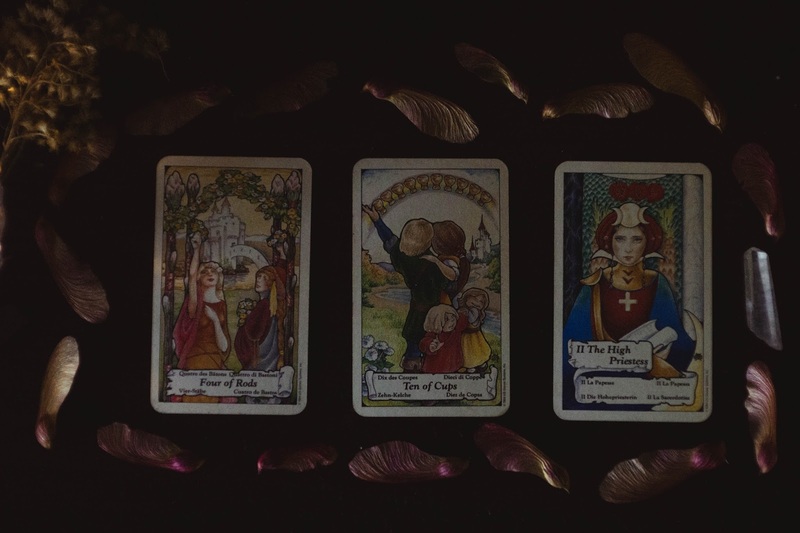 These cards all point to abundance and following a higher calling. However, the energy of the full moon itself can cause a bit of a confusing atmosphere where direct action is concerned. So many directions and paths seem to be opening up, and perhaps there is a bit of hesitation and confusion regarding which path to take. Well, I always think if you don't know what to do in life, sometimes it's best to do nothing at all, and wait for the tides to shift in favor of whatever path you are meant to take. Or just flip a coin. Either way, you can wait to make a decision, or you can go with what feels right at this present time. If things turn out sour, you can always start again. Or if you wait to decide, maybe one of the paths will start to really call to you. All I know is that when you listen to your heart, things tend to work out one way or another.